In this short article we will go through the concept of fragments and how you can reduce the code of your queries and match the exact data needs for your UI. Each fragment contains the name of the fragment (userFields), to what type we are applying this fragment (User) and the selection set (id, firstName, lastName, phone and username). Now we can rewrite the getUsers query with the fragment and spread operator. The results are the same, but in terms of refactoring and code reuse, there are many advantages to writing queries this way. Statements on User and on Company are the type conditions. With type conditions we are able to apply each fragment on different type in the schema even that both types User and Company have different fields. In other cases, the fragments are also frequently used in frontend caching clients like relay or apollo. In relay we have the so-called fragment container, which defines the component’s data requirements of the component. In the apollo-client, we use the concept of fragments for the so-called queries collocation. Fragments in these caching clients are basically perfect matches for the data needs of the UI components. This can be used to our advantage for static typing with flow or typescript. 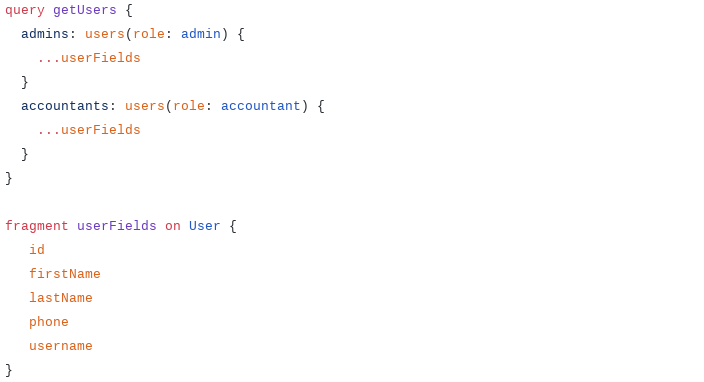 We can generate flow or typescript definitions from our GraphQL schema and use these definitions as the prop type definition for our UI component. One of the best tool for this is apollo codegen. Did you like this post? Then clap for this article as it makes it easier for others to find it. The repository with the examples and project setup can be cloned from this Github branch. You can get early access to upcoming free GraphQL course by subscribing at graphqlmastery.com. High quality GraphQL courses and articles about GraphQL, React, Apollo & Node.js. You can checkout our free GraphQL course at https://graphqlmastery.com/course/graphql-language.